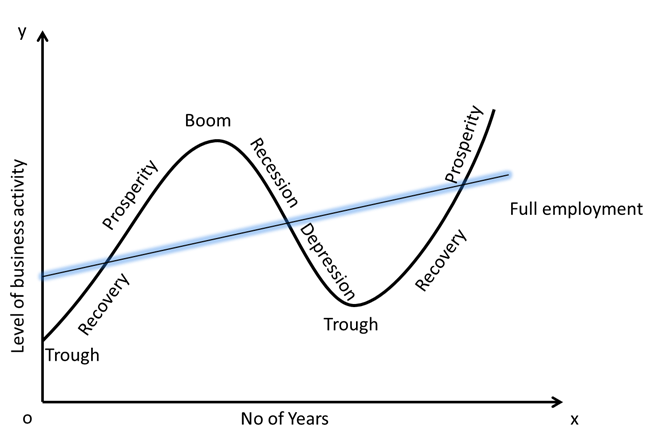 An important feature of the working of a capitalist economy is the existence of alternating periods of prosperity and depression generally referred to as a ‘business cycle’ or ‘trade cycle’. In a business cycles there are wave like fluctuations in aggregate employment income, output and price-level. 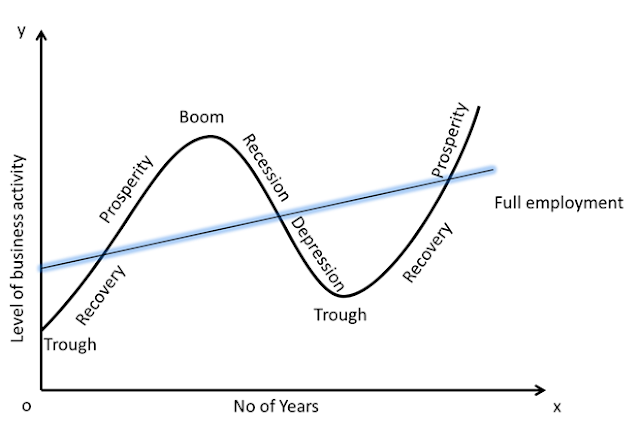 The term business cycle has been defined in various ways by different economists. Prof. Gordon’s definition is precise,” business cycles consist of recurring alternation in aggregate economic activity, the alternating movements in each direction being self-reinforcing and pervading virtually, all parts of the economy”. The most acceptable definition is that given by Prof. Mitchell in these words,” Business cycles are a type of fluctuations found in the aggregate economic activity of nations that organize their work mainly in business enterprise”. Thus business cycle, in short, is an alternate expansion and contraction in overall business activity, as evident by fluctuations in measures of aggregate economic activity, such as, the gross product the index of industrial production, employment and income. Generally speaking, the cyclical fluctuations have a tendency towards simultaneous appearance in a;; the branches of the national economy. But sometimes they may be defined only to individual sectors of the economy. Cyclical fluctuations in such cases are referred to as specific cycles. A business cycle is a wave like movement. Business cycles operate periodically at fairly regular intervals of 10 to 12 years. Business cycle is of an all embracing nature, that is, it prevails in all industries, all occupations including agriculture and all areas in a country. Expansion and contraction in a business cycle are cumulative in effect. Business cycles are all-pervading in their impact. 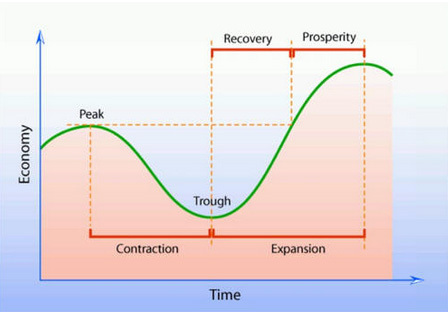 A business cycle is characterized by downwards and upward movements. In business cycles, cyclical fluctuations are recurrent in nature. very interesting and very valuable information about the self help motivation. nice work. This blog is having the very nice information about implementation consulting. Here we can have all the information about it. Thanks for sharing this wonderful article. I liked your blog. This is too good .Thanks for sharing with us the detail about Business Cycles.